Throughout the centuries, underground societies have ruled the Earth by virtue of their immense wealth, unscrupulous arrogance, and hilarious hats. Now a more benevolent, less awkwardly dressed organization is ready to rule, and they want you with them: the Patrón Secret Dining Society. Hosting covert dining experiences in unconventional venues nationwide, the Patrón Secret Dining Society is set to release the location of their next dinner this Monday at 4pm EST, an exclusive event featuring exclusive Patrón Tequila cocktails by a premiere mixologist and a worthy feast from a renowned chef. To win two seats at the table, you'll have 30 minutes from 4pm to solve a riddle (hint: probably not the "what walks on four legs in the morning" one). 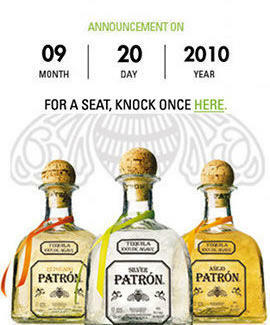 If you answer correctly but don't snag a seat, you may still win one of three Patrón Tequila Treasure Troves: a curated basket with all the goods you'll need to create the Patrón Secret Dining Society experience at home, except the chef and mixologist, who for some reason balked at being shipped in a trove. To be eligible, both you and your guest need to be Patrón Social Club members prior to the release of the location and riddle, so register this very minute at PatrónSocialClub.com -- because without the sight of you in a fez, the underground just isn't the same.